Argos has installed free Wi-Fi in each of its stores across the UK. The high street stalwart owns 735 shops, which it claims play host to more than 124 million customers a year, all of whom will now be able to access the internet while shopping. O2 was chosen as the provider for the network, but customers will be able to access the Wi-Fi regardless of what mobile operator they use. “We have seen strong growth in mobile transactions, with sales through mobile devices now accounting for 16% of our total sales,” said John Walden, managing director of Argos. “There is a strong appetite from our customers to have the convenience of accessing their devices on the move, in a way that suits them. O2 provides 9,000 hotspots across the UK and has signed a number of deals with well-known high street names, including Subway, Costa Coffee and McDonalds. Customers who have already signed up to O2 Wi-Fi will automatically connect when entering an Argos store, whereas new customers will have to go through the sign-up process first. Once connected, users will be able to view extended online ranges and get access to exclusive online deals and offers, as well as use the network for their usual browsing activities. 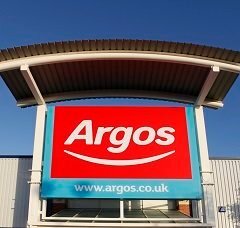 “We’re delighted to work with Argos to deploy our state-of-the-art Wi-Fi for customers and employees, building on our existing relationship with Home Retail Group,” said Ben Dowd, business director at O2.